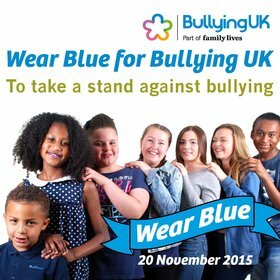 Bullying UK has launched its wear blue campaign to encourage schools, organisations and individuals to wear blue on the 20th November 2015 to help tackle bullying. The anti-bullying charity has also produced wristbands for our #wearbluecampaign that schools and families can wear to support children who experiencing bullying. Visit our wear blue page for more information. Bullying UK is also offering downloadable superhero masks for younger children to decorate and wear alongside other anti-bullying week resources which include classroom flash cards, presentations, interactive anti bullying videos and posters. To download a copy of our wear blue campaign poster, please click here. For information and updates, please visit Bullying UK on Facebook, Twitter or email us webcoordinator@familylives.org.uk. For media enquiries, please contact Simon Walsh, Family Lives Press & PR Manager via press@familylives.org.uk. Funds raised from the #wearbluecampaign will enable Bullying UK to support those who are being bullied or affected by bullying issues.